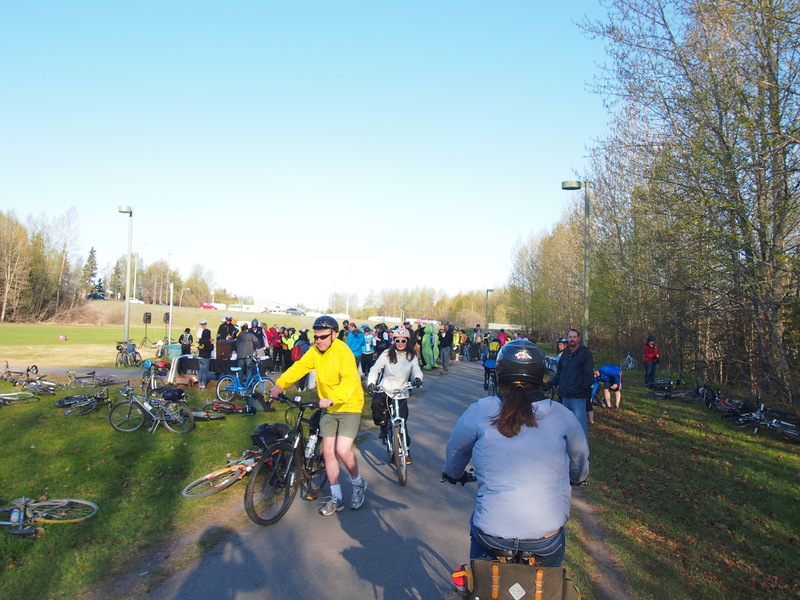 Spring comes late: Riding Petersville Rd. 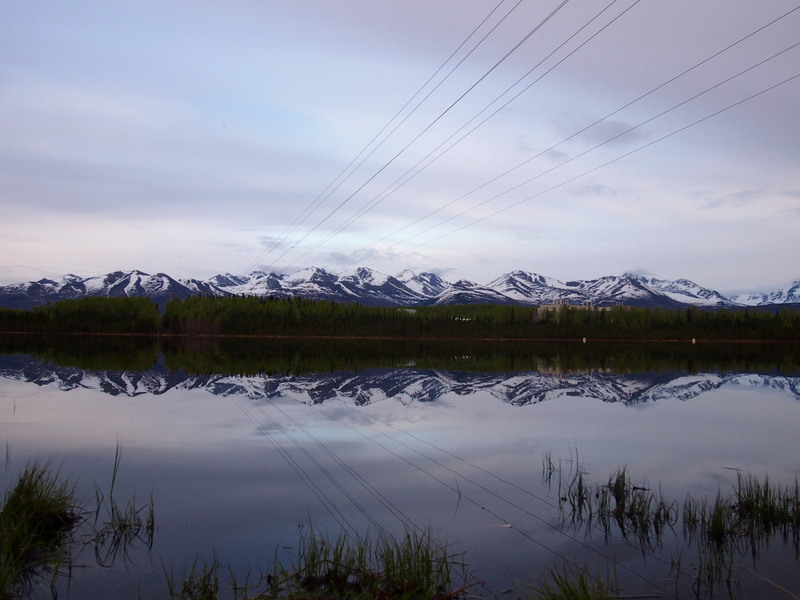 The Petersville Road accesses the southern foothills of the Alaska Range, to the west of Talkeetna and Trapper Creek. 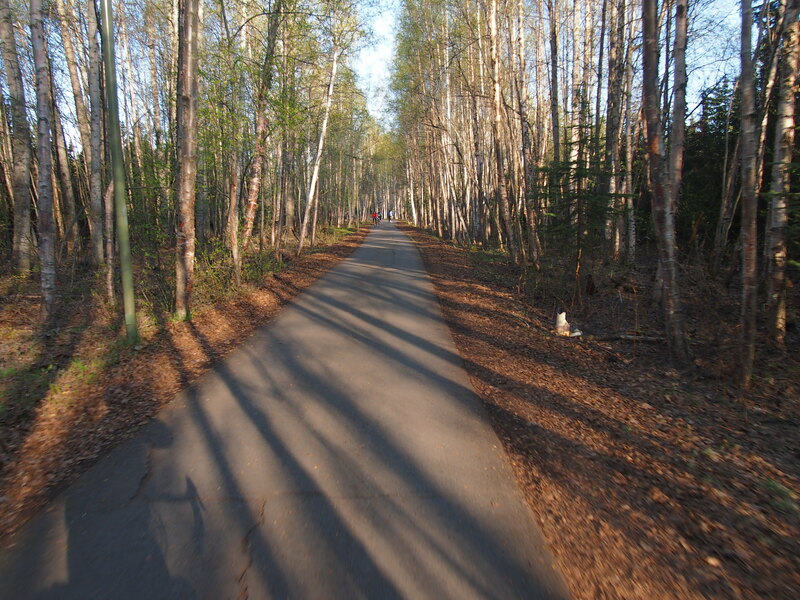 Once a wagon road for miners from the Talkeetna area to reach gold claims, including the Cache Creek Gold Mine, the road is now passable up to twenty miles by standard motor vehicle in season. In winter, the area is criss-crossed with snow machine routes. In spring, which comes late, it’s a bit messy. 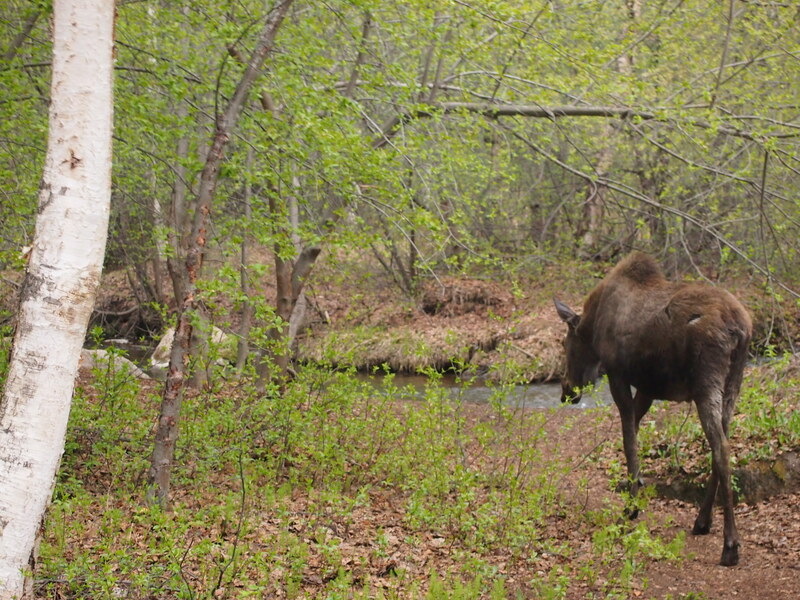 At the intersection with the Parks Highway at the Trapper Creek Inn and and gas station at milepost 115, ten miles of pavement are found toward the west with minimal elevation gain– simply follow the sign towards Moose Creek and Peter’s Creek. Thereafter the road turns to dirt and the scenery flourishes. On a clear day, the views of Denali tempt further travel as it peers higher and higher above spruce at each successive body of water. Crossing Kroto Creek and several other drainages presents a few short, challenging climbs, and a mild net elevation gain. An upward turn in the road and several structures mark the settlement of Peter’s Creek at mile 19, and the road becomes less suitable for standard automobile traffic, although it is easily passable on a hybrid or mountain bike. In the spring, or after recent rain events, the road may be muddy and rutted. 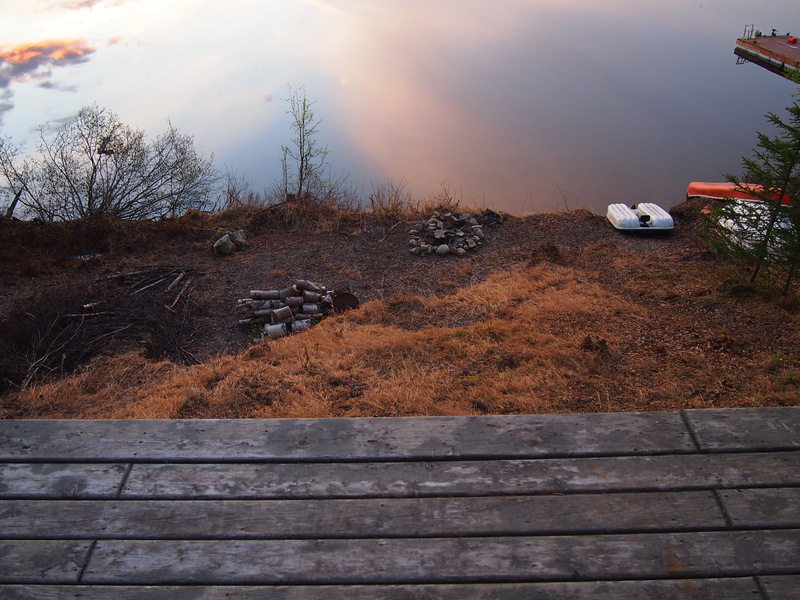 What I found in late May, after a record setting snowfall, were melting snowdrifts and mud. And, lots of locals enjoying the holiday weekend on roaring ATVs. A nice weekend with the family includes driving a truck until it can pass no further, then the ATV until blockaded by snow and mud. Crack a beer, shoot a gun, then come roaring back for dinner. Welcome to Alaska. Despite the busy holiday weekend, it’s still wild out there and the road continues at least 12 miles beyond the melting snow piles that stopped me. It passes through the Peter’s Hills, and provides access to several gold mines, and it is said that some routes eventually end at the National Park boundary. 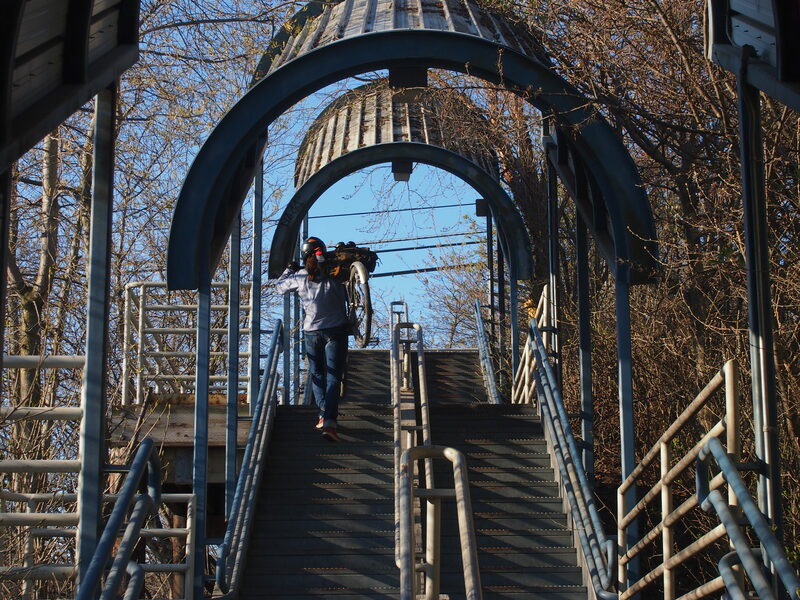 There is also rumored to be a scenic canyon as you pass through the Peter’s Hills, about thirty miles in. I made it about 27 miles until I was pushing through snow more than riding. I retreated a few miles for the night and made camp high above Kroto Creek, which was flush with spring melt. The last set of ATV tracks. I later learned that they had traveled only a few hundred feet further before encountering an impassable snowfield. Aside from wet feet and a heavy bike, passage by foot was tolerable. This was the end of the road for me, about two miles short of the abandoned settlement at Petersville, and only a few miles further into the Peter’s HIlls, pictured in the distance. 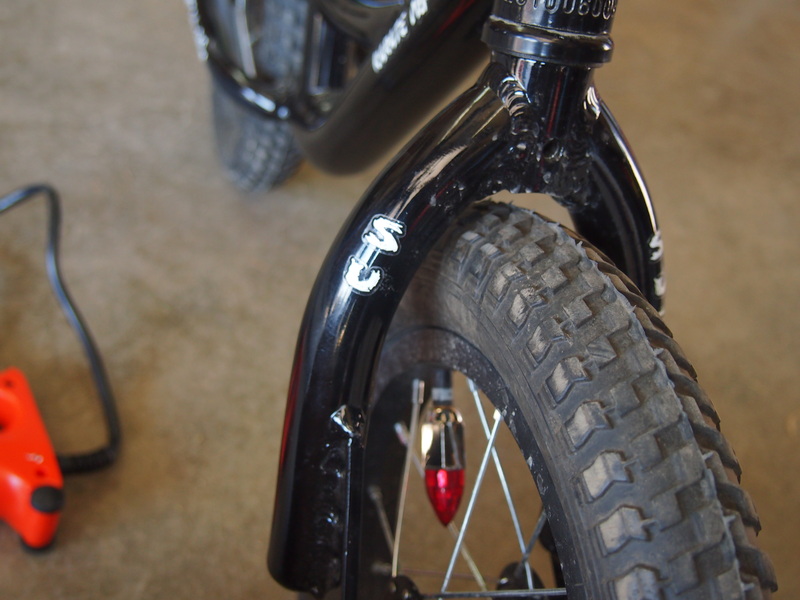 It would have been a convenient time for fat tires on the Pugsley. Camping: Private lands surround the paved road until mile 10, at which point the dirt road is dotted with turnouts suitable for camping. Some private lands are signed along the roadside, although they become less numerous as you go. There are public restrooms at Kroto Creek and a large parking area, full of RV’s on holiday. A map will not be necessary if you stick to the main road, although there are some interesting side trails which were flooded with mud this time of year. There were very few junctions, although the road may become less defined as it diverges toward gold mines and hunting camps further in. I wasn’t even a bit concerned about how to find my way back in the first 27 miles. There is plenty of surface water along the route. Certainly, bear deterrent and proper food storage are advisable. Retreating the next day, I found sunny skies and quick passage as I lost elevation back toward the Parks Highway. I became successively happier when I returned to dry dirt road, then graded roads, then finally pavement and 20 mph riding back to Trapper Creek for a coffee and a mid-afternoon breakfast sandwich. The Trapper Creek Inn has free wifi and great sandwiches. Schwalbe Big Apple 26 x 2.35 tires on Surly Marge Lite 65mm wide rims. 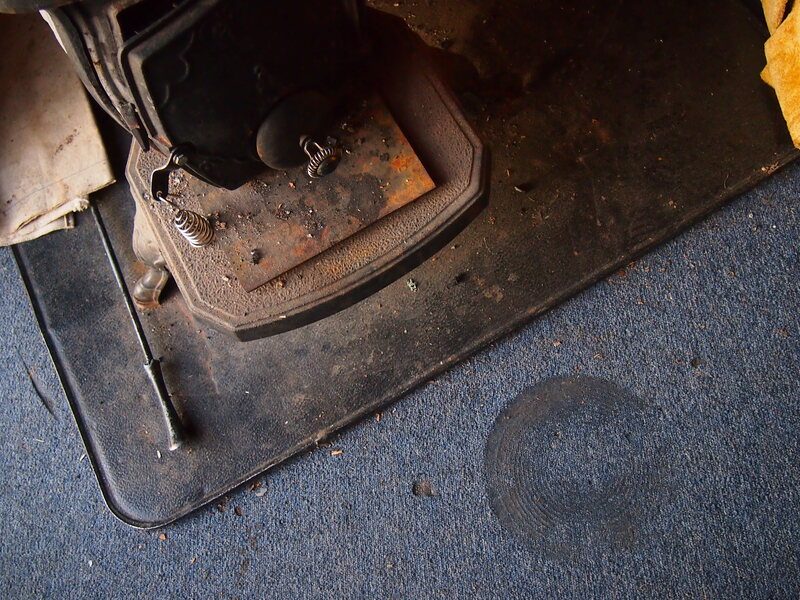 The low-profile tread rolls well on pavement, and the tire volume and wide footprint do well to smooth bumpy dirt roads and float over mud and loose sediment. I was especially impressed at how I was able to float over wet spongy sections of unconsolidated glacial till– silty, sandy, gravelly stuff with a mix of clay that swells with water. Traction on heavy, melting snow was terrible, but that didn’t stop me from trying to ride through every section of snow in my path. 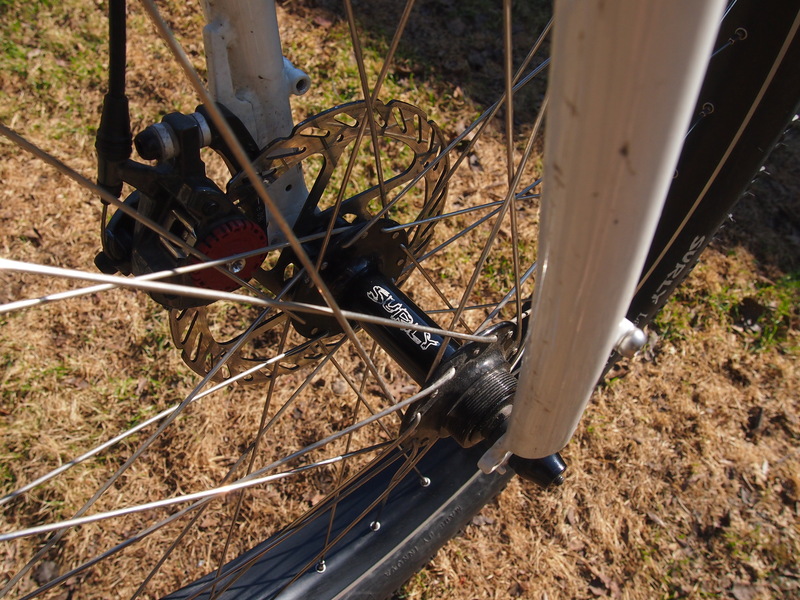 I did little to adjust my tire pressure, which may have helped, as traction and ride quality were generally quite good. Plenty of existing campsites along the road. And views of Denali, especially between Trapper Creek and Peter’s Creek in the first 20 miles. The views would have been incredible from atop the Peter’s Hills, beyond mile 30. 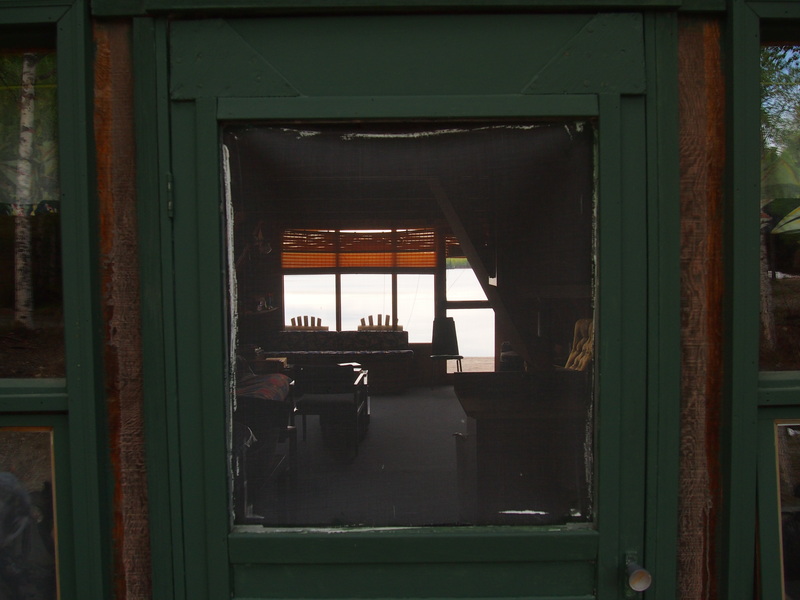 Detail of the area, posted inside the Trapper Creek Inn. It’s a good reference to look at before you go. They also sell maps of local snow machine routes, and the DeLorme Alaska State Gazetteer. I was about two miles short of the Petersville, indicated by the number 9 on the top left of the map. 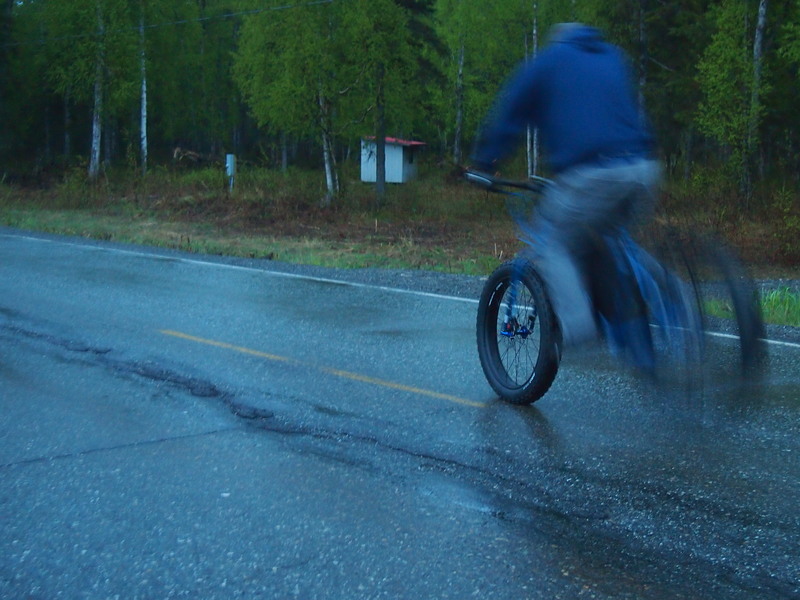 In dry summer conditions, medium volume tires would be adequate for most of the Petersville Rd. An idyllic homestead only a few miles from Trapper Creek. Views of Denali, The Great One, are inspiring and precious. Many park visitors never see the peak due to the unique weather patterns in the Alaska Range. This home has no shortage of amazing scenery. A sign indicated it was for sale, if you’re interested. 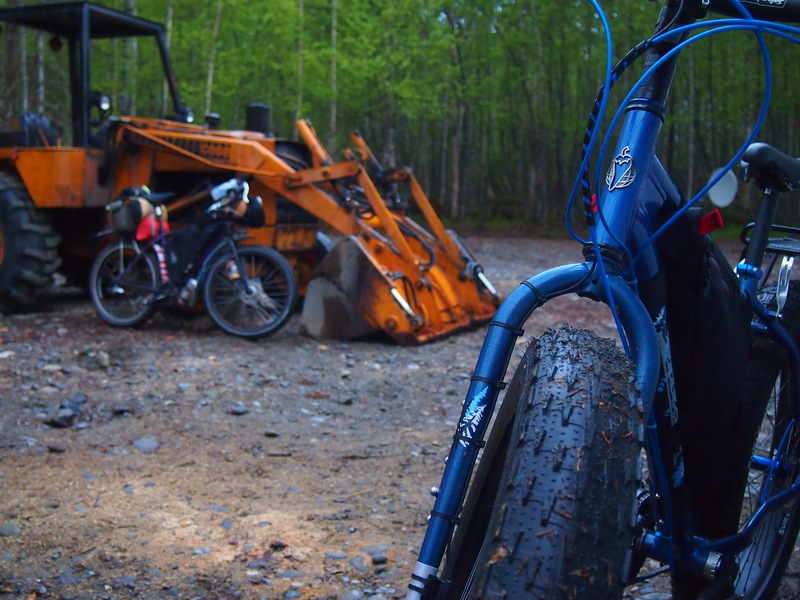 Fatbikes are the S-10s, 350s and Rams of the bike world and it’s no wonder that Alaskans love them. 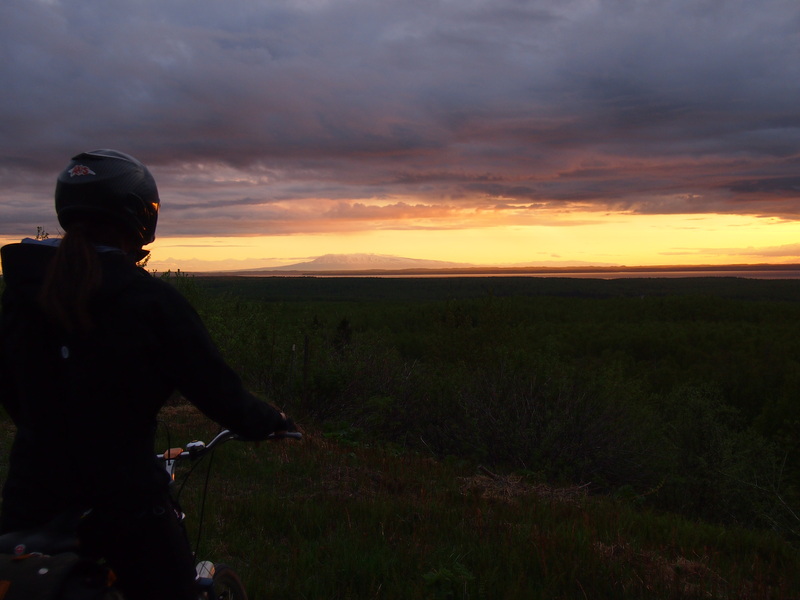 Ride them all winter on snowmachine trails, then float over gravel along the Susitna River and venture into the thick on unsigned, unmarked and unmapped ATV trails. 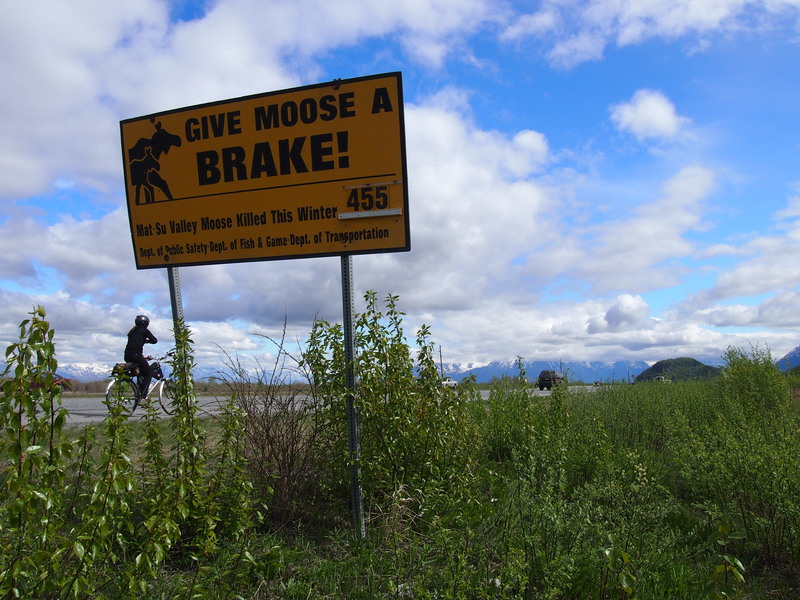 These are Alaska bikes. Mine is an Alaskan road bike. 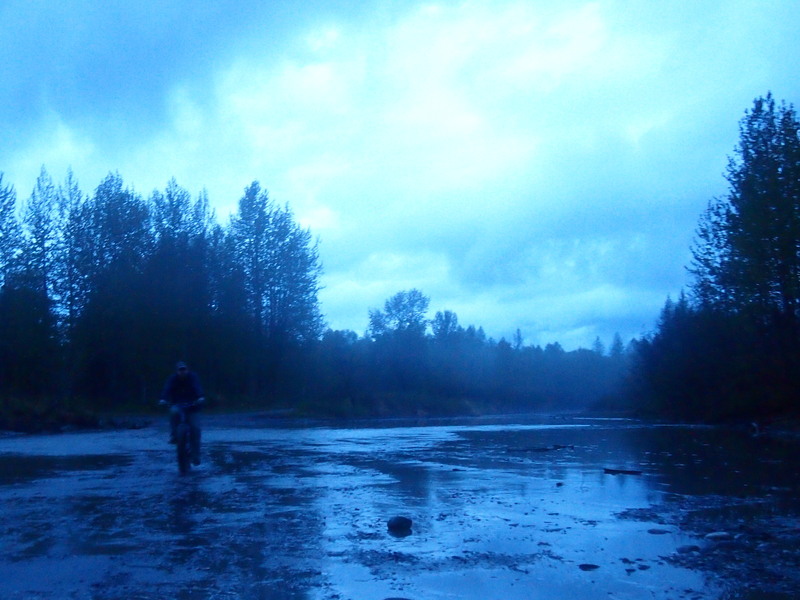 Jeremy’s Salsa Mukluk 3 receives it’s first mudbath while creek-crossing near the Susitna. It endos and wheelies like a bike should, and passes the rigorous testing of an ex-BMX rider. 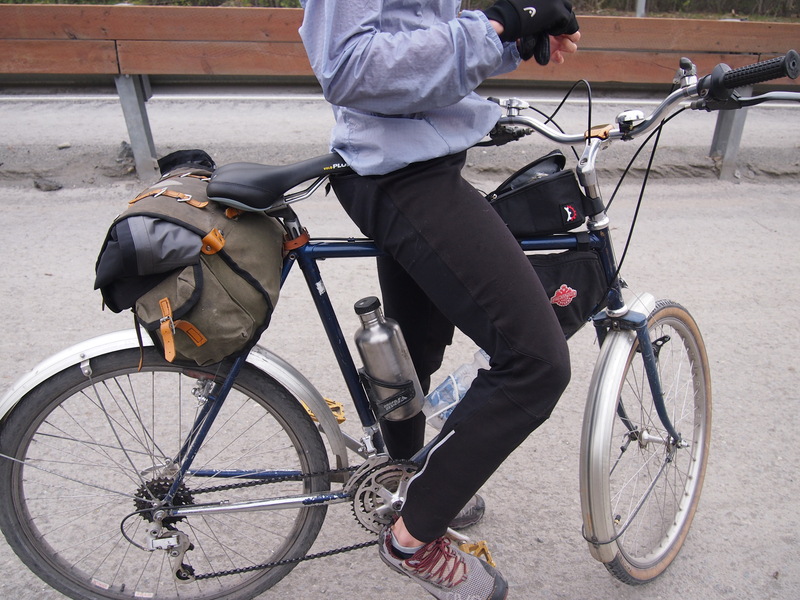 A Revelate framebag has permanently converted him from his usual habits of riding with a backpack. A rack will serve as overflow capacity; never again a backpack. Lots of families have them, especially in places like Maine and Minnesota and Alaska where glacial lakes abound and summer is precious. 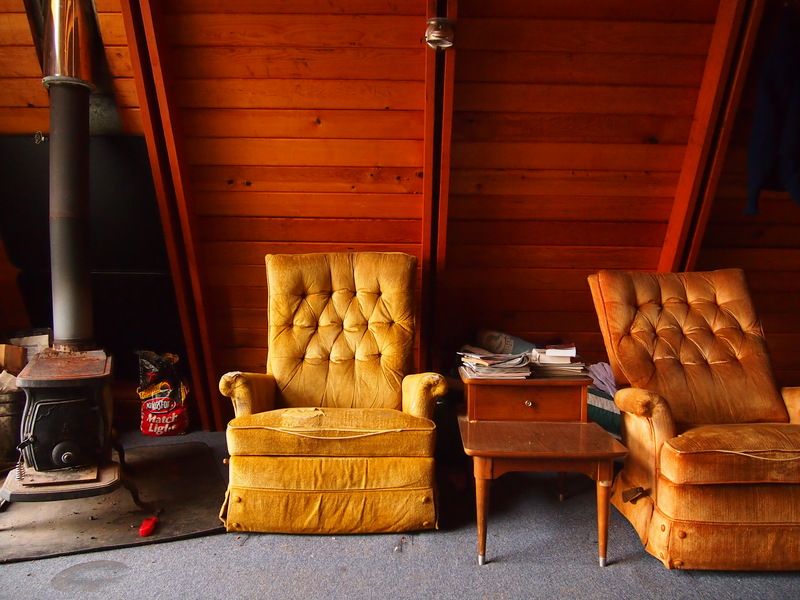 My residence for a night, this cabin is a snapshot of life several decades ago. 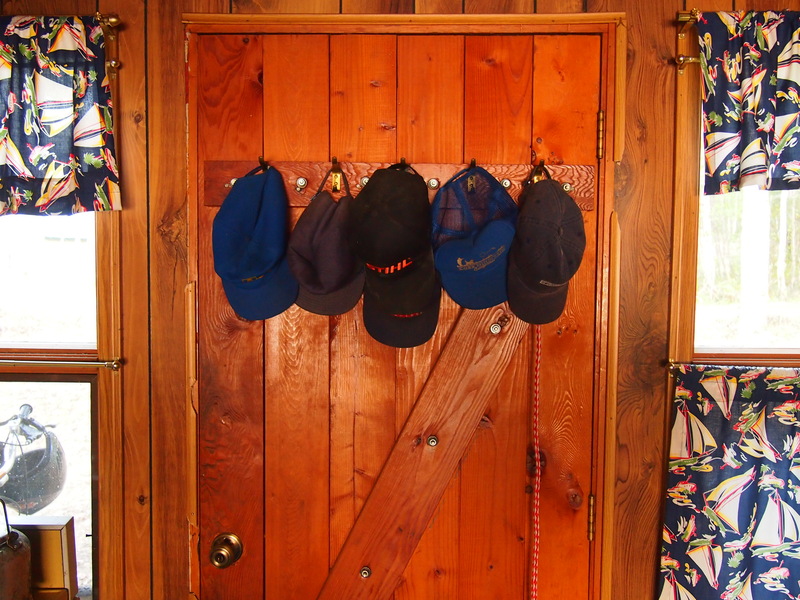 The homely subtleties abound, including the lineup of hats advertising local bars, chainsaw manufacturers, and trucking companies. 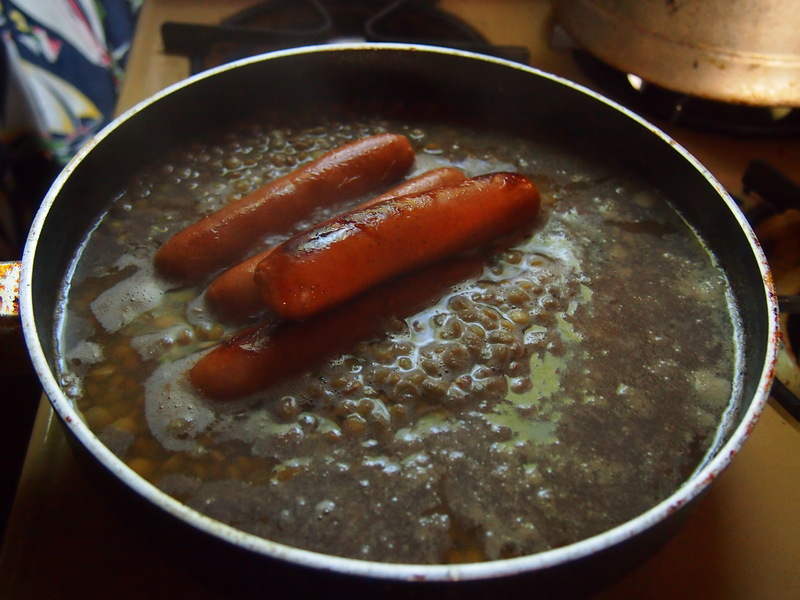 A thick pot of coffee served with pork and beans start the day. 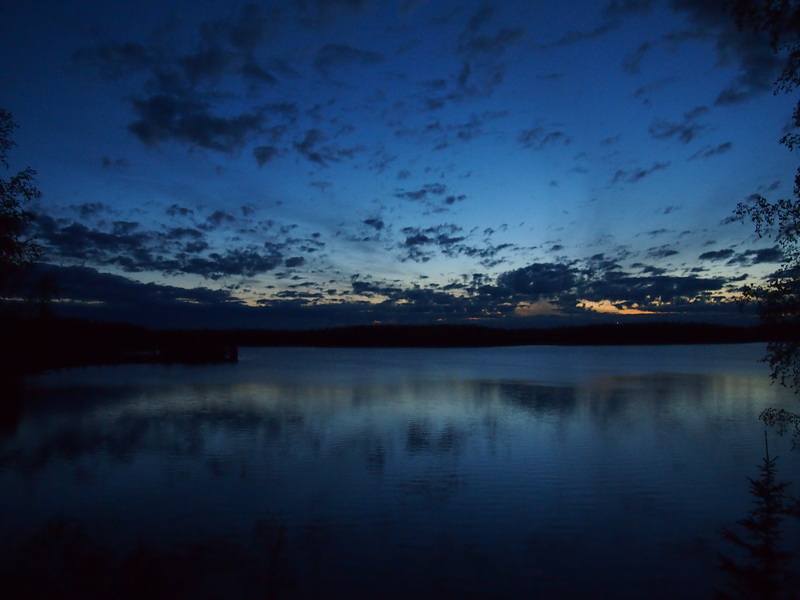 The draw has always been the location, and the lake’s crystal waters. 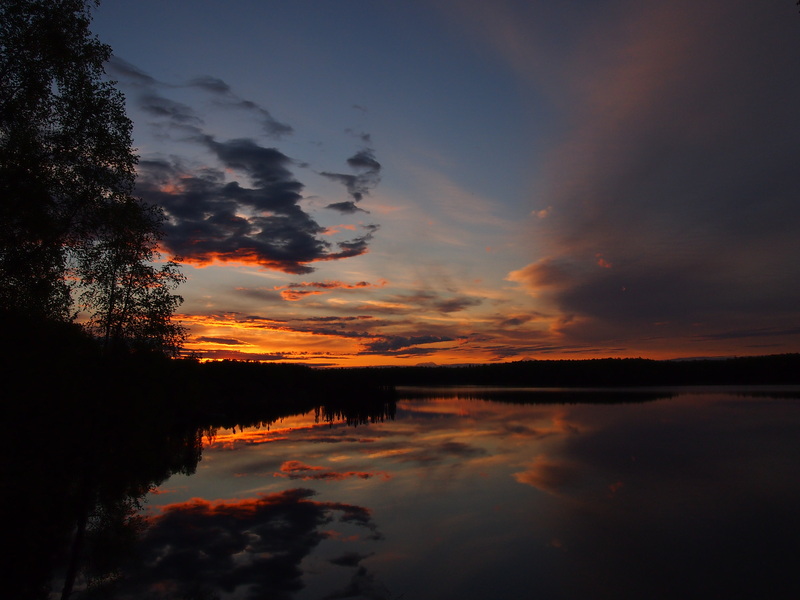 The midnight sun saturates the northern sky across the lake. 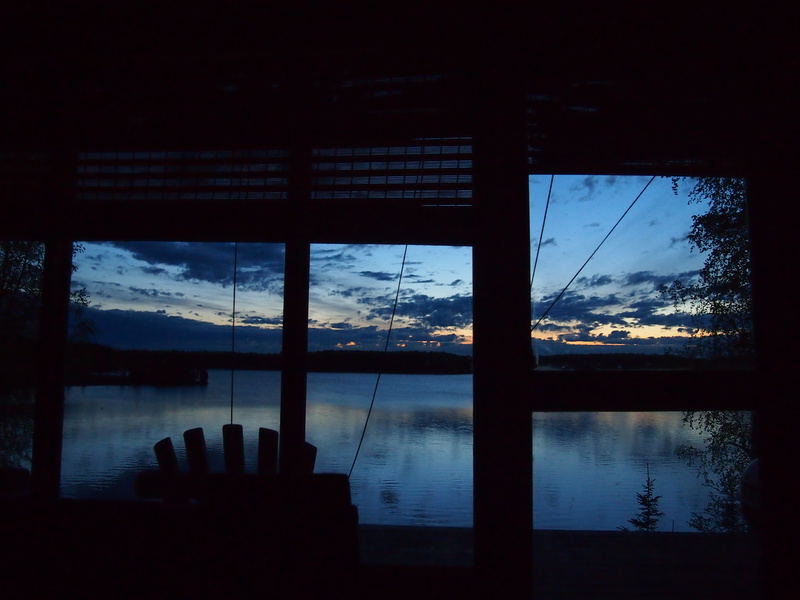 Linger on the deck, the sun hanging in the sky. Midnight. Denali and Mt. Foraker peer above the horizon. 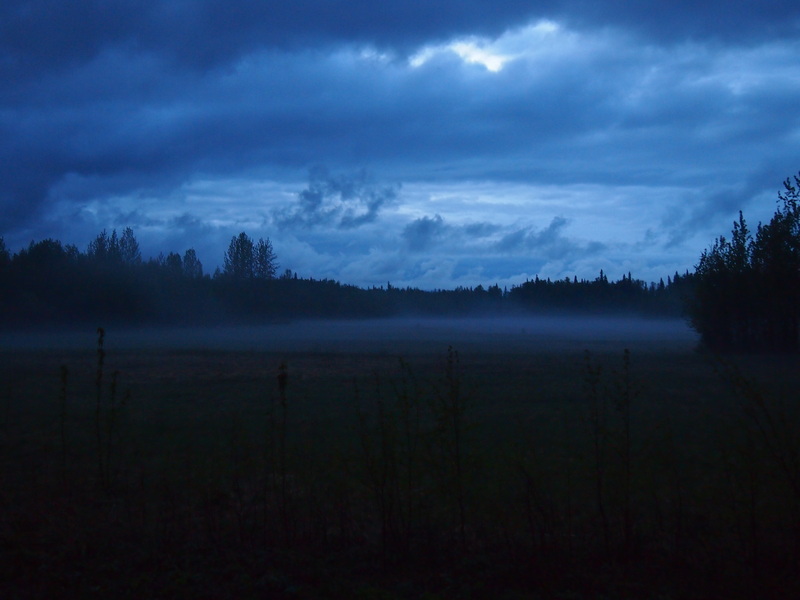 Never dark this time of year– 2:30 A.M. Absent the familiar bedtime cues, we roll into bed midway to morning. Looking ahead: There are only a half-dozen major highways in the state, but this area has a few interesting unpaved spur roads. 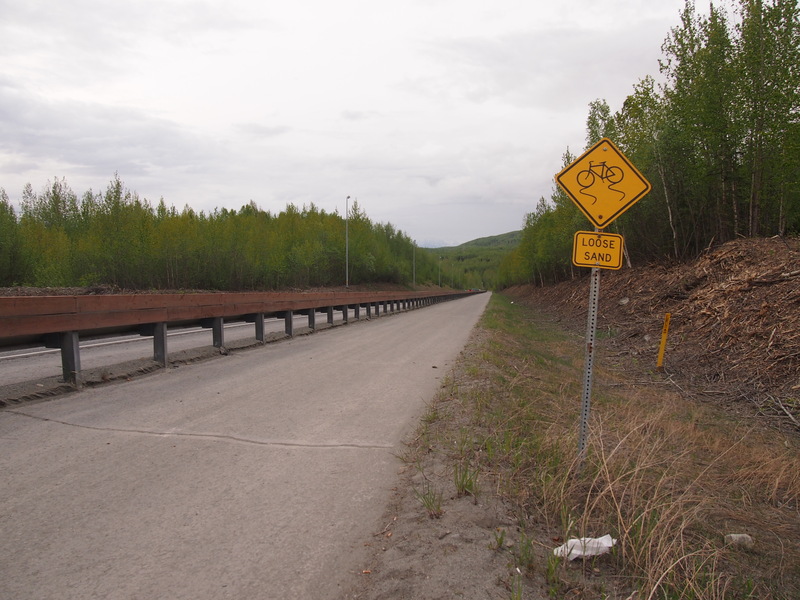 The Petersville Road extends about forty miles from Trapper Creek (mile 115 on the Parks Hwy) toward the south side of Denali National Park and accesses the historic Cache Creek Gold Mine. The Denali Park Road, further north, reaches ninety miles westward on the north side of the Alaska Range to Kantishna. 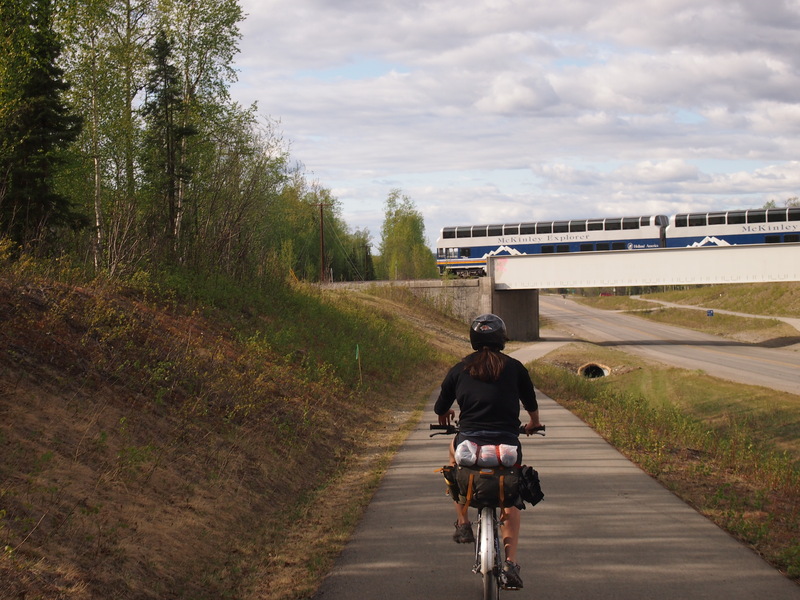 Further north, the Stampede Trail reaches westward from the Parks Highway in a narrow finger of state land, disintegrating into multiple game trails, surrounded by Denali NP on three sides. Across the Teklanika River on the Stampede Trail is the famous site of ‘the Magic Bus”, where Christopher McCandless spent a reclusive season as made public in “Into the Wild”. The Denali Highway leaves the Parks Highway toward the east, and will be my eventual escape route out of the state. Trying and trying to leave town, although I’ve put off making fenders and wiring my rear light for several days while I tend the lists I’ve scribbled onto the back of receipts and napkins. 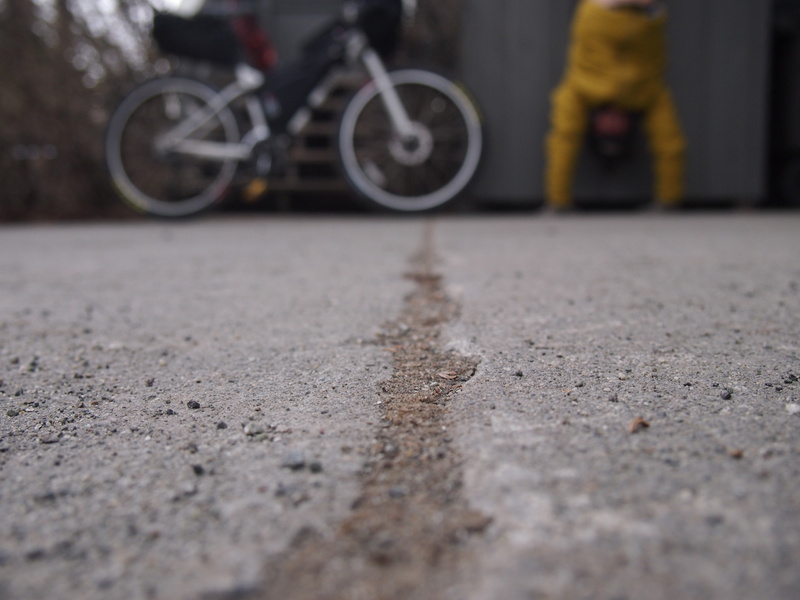 Planning to be on the road for several months, a few extra days of preparation and planning will help to ensure a reliable bicycle and a smooth trip. 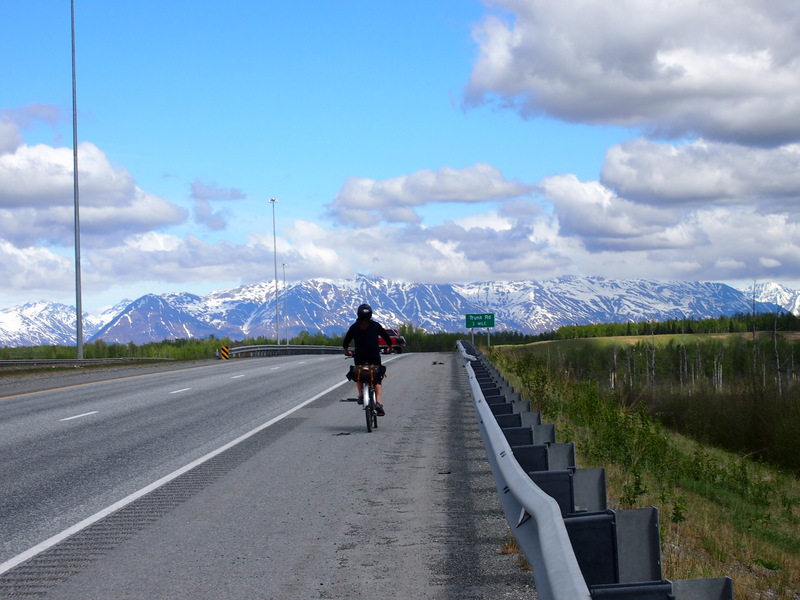 I’m planning to ride the Denali Park Road and the Denali Highway on my way out of the state. The Park Road is a 90 mile dirt road into the heart of the park to the settlement of Kantishna. Private motor vehicle traffic is extremely limited as most visitors are required to travel in Aramark-operated school buses, which reduce traffic volume to several dozen vehicles a day on the only road in the park. 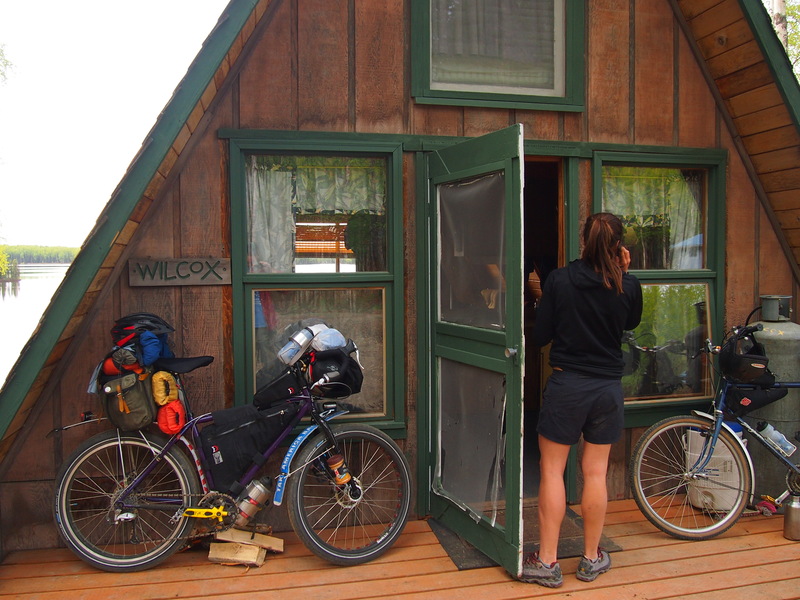 The unpaved park road offers some of the best dirt road riding and scenery in the entire state, and free wilderness camping permits are issued to hikers and cyclists, who are required to hide their bikes from view of the road and make camp a short walk further. It’s a highly regulated system, but it effectively preserves and simulates the kind of wilderness experience most visitors expect. 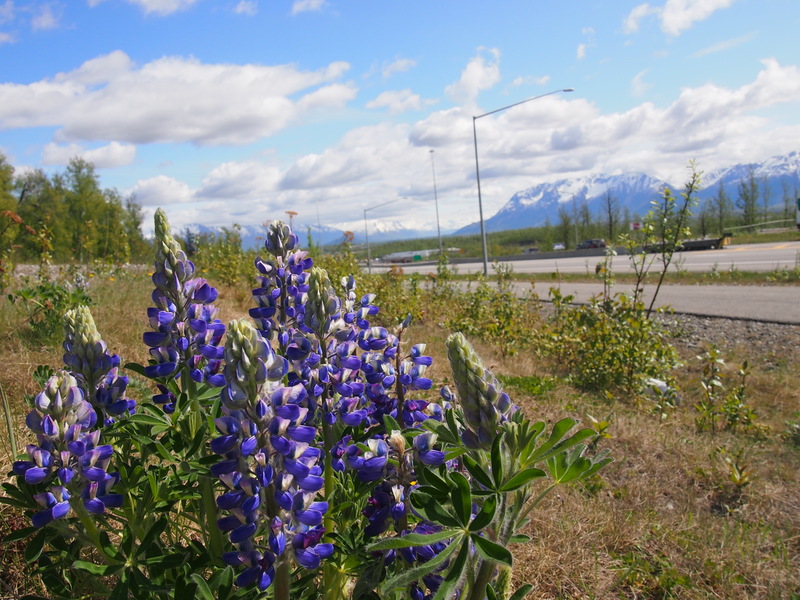 The Denali Highway, not to be confused with the Denali Park Road, is a 135 mile connector between the Parks Highway at Cantwell and the Richardson Highway in Paxson. 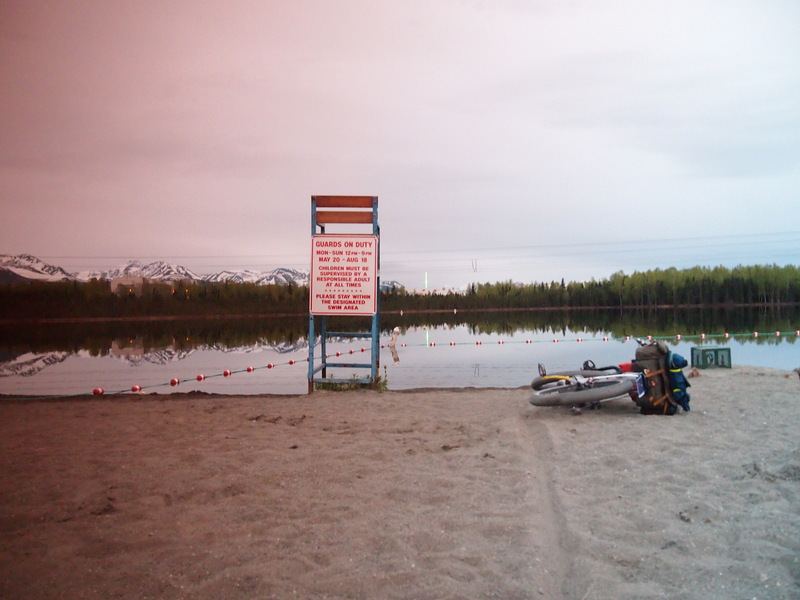 Most of the surrounding land is managed by the Bureau of Land Management, including several official campgrounds, which makes this another favorite Alaskan ride. Before the (George) Parks Highway was built in 1971, the Denali Highway was the main automobile route to Mt McKinley National Park (since renamed Denali). The Denali Highway was built as recently as 1957. I have a short shopping list including a 1L drink bottle for my fuel, some scrap metal to complete a custom taillight bracket, and bear spray. I’ve made a 4″ wide rear fender out of an $8 piece of aluminum from Lowe’s, some coruplast signage promoting Joe Miller’s Senate bid in 2010, and salvaged stays from a Planet Bike fender and an old chrome balloon tire fender. In short supply of the proper tools, I managed to piece the whole thing together with the leather punch on my Swiss Army knife and a Park multitool. 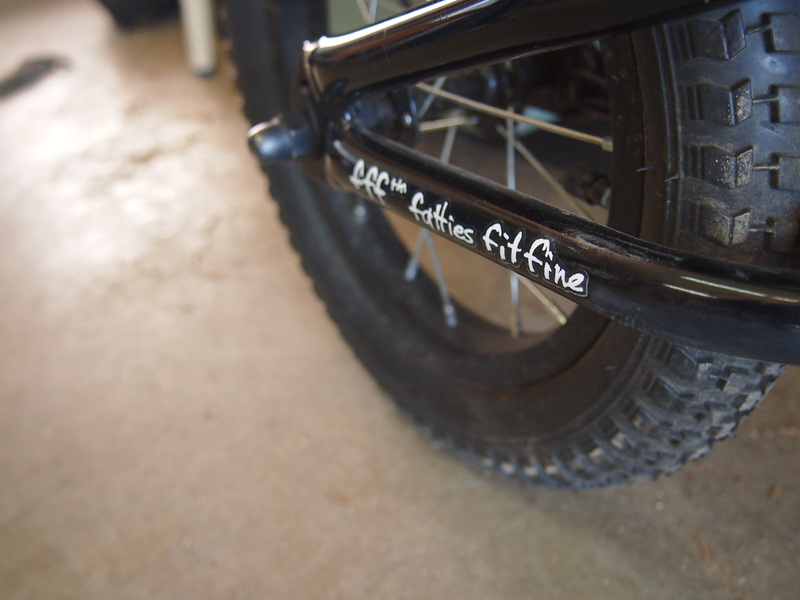 The front fender will make for some conversation, as it features Joe Miller’s campaign slogan in four-inch tall lettering. It’s nice to have lights and fenders again. The bike is finished, finally. It’s ugly, and purple and excessively practical, but it’s done. Boz Scagg’s song “I’ll Be Long Gone” is a classic from his eponymous 1969 Atlantic release. The album was recorded in Muscle Shoals, AL with the usual cast of Swampers, and features Duane Allman on guitar. Check out the guitar solo on “Loan Me a Dime”, from the same album. 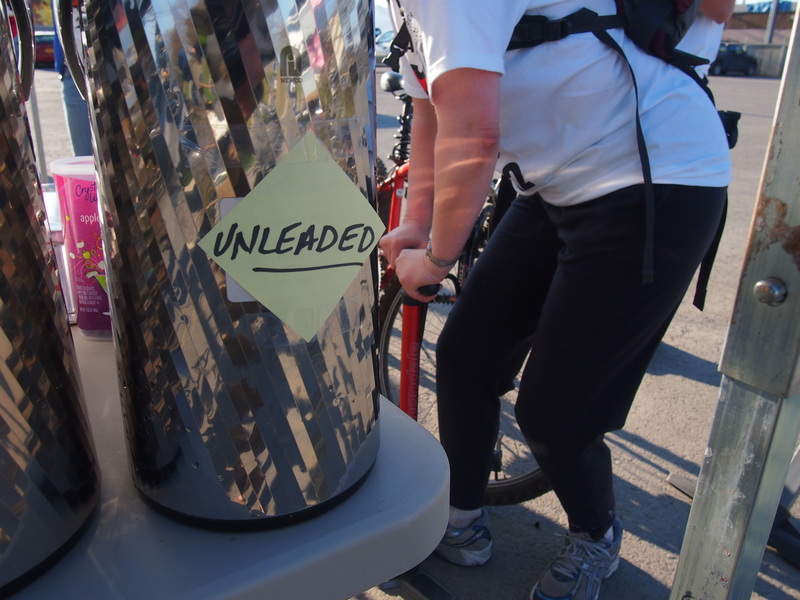 Gainfully unemployed, I had plenty of time this morning to hunt Bike to Work Day feed stations. 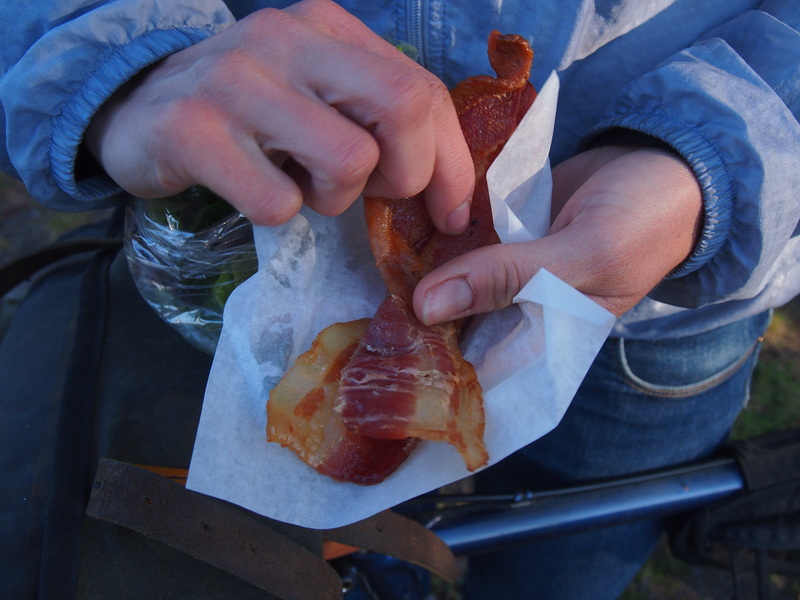 One popular station on the Chester Creek Trail was stocked with bacon, courtesy of the Spenard Roadhouse; cinnamon rolls from Great Harvest, and vouchers for a free beer at the Midnight Sun brewery this evening. Bacon in the morning and beer in the evening and bikes all day. Bikes every day. Bike everywhere, every day. 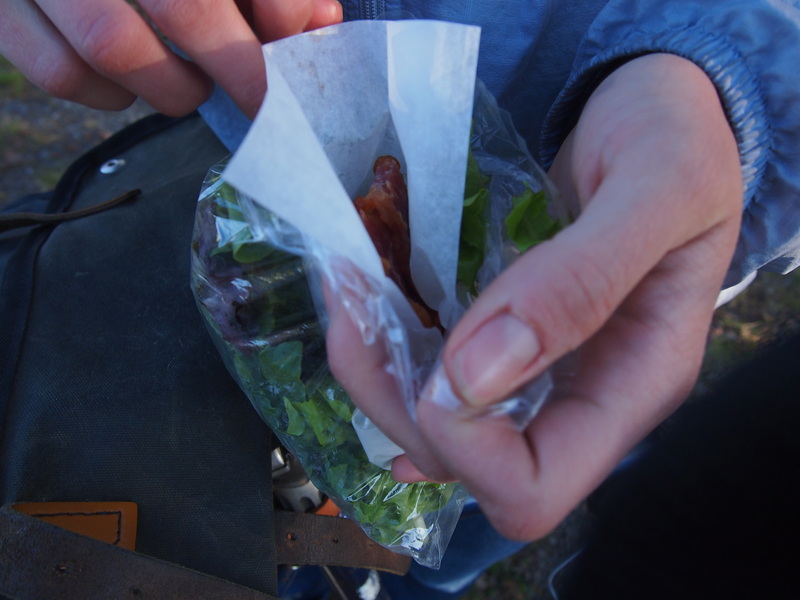 Lael receives her bacon. Lael saves her bacon for later. I wrapped my bacon around a cinnamon roll and ate it immediately. 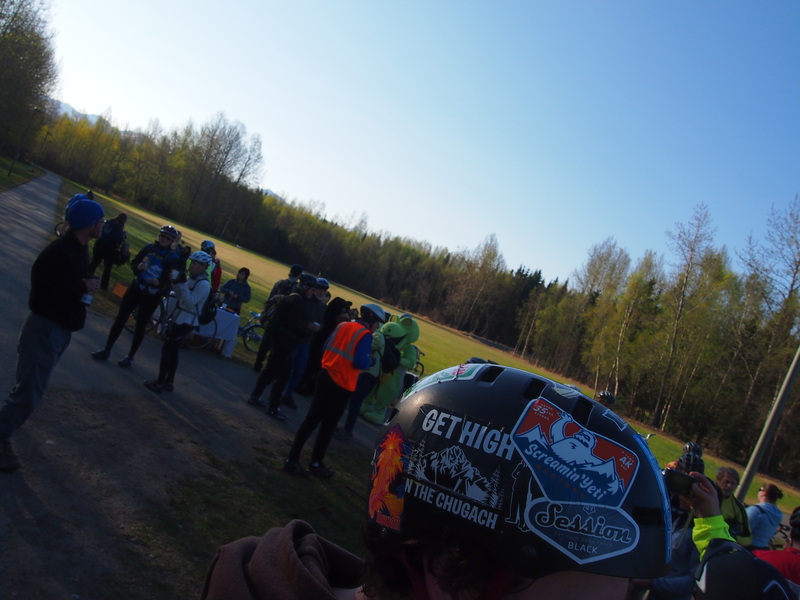 Backpacks, old Rockhoppers and high visibility clothing all made a good showing. Two matching riders breezed by on a 5 speed Schwinn Twinn on C Street, while a late 80’s Sierra with a 16 inch tall stem took the bus. 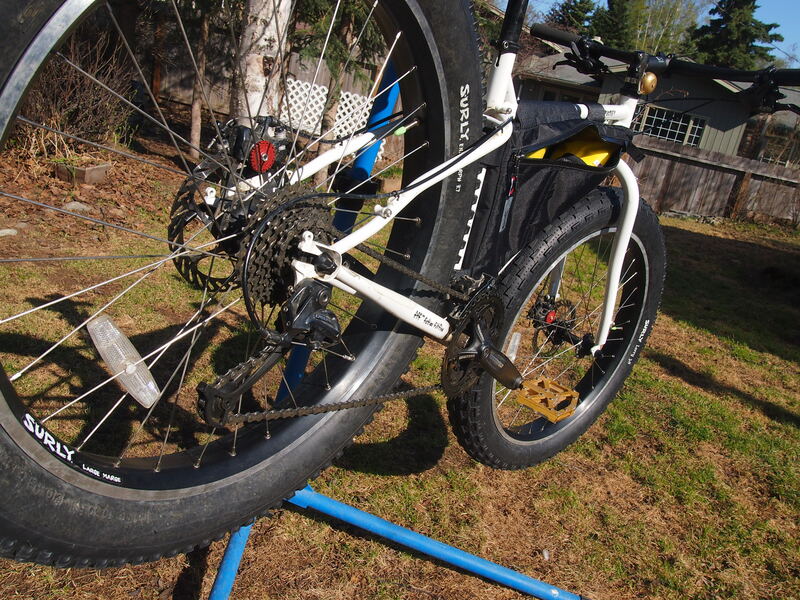 A carbon Ridley cross bike with tubular tires shared a resting spot with an old Bridgestone MB-1. The purple Pugsley with the smooth tires and the “racing” handlebars confused at least two people. A 2012 16″ (SM) Surly Pugsley snowblind white frame and fork with upgrades is for sale. This bike was ridden in the snow, and has only seen pavement and dirt on a few commuting rides this spring. It was purchased in December. Wheels, brakes and drivetrain parts are stock, including Avid BB7 brakes, Truvativ Hussefelt crank and Deore 9sp drive parts. 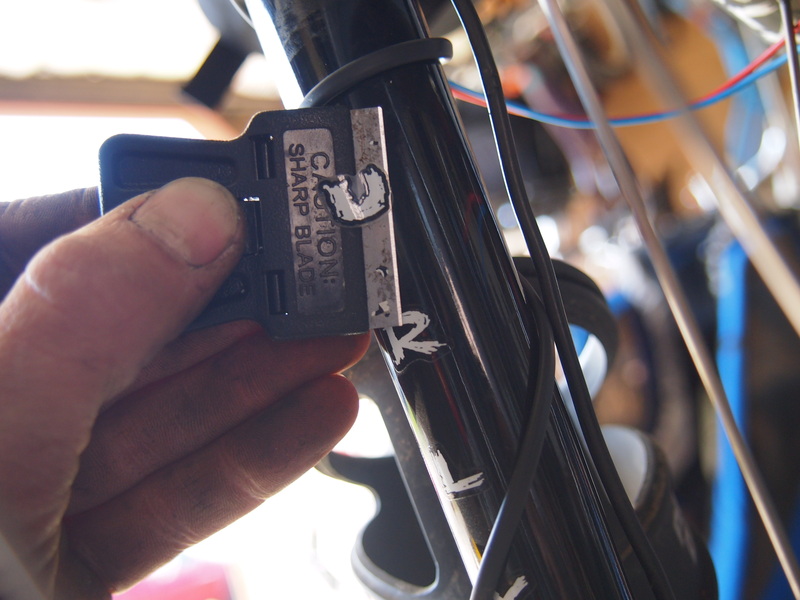 Upgraded parts include a Cannondale stem with 31.8mm clamp and a Salsa Bend 2 handlebar (31.8mm clamp, 17deg sweep). 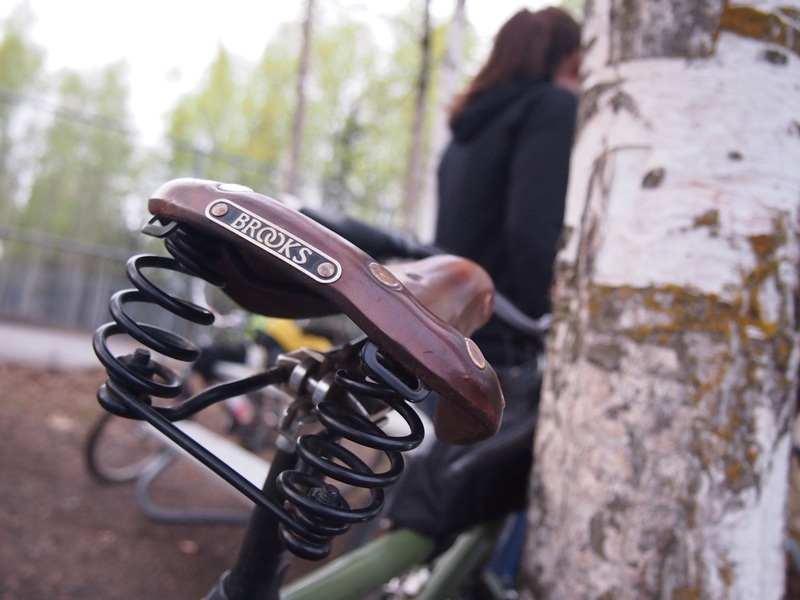 The spacer mounted brass bell is included; the pedals are not. 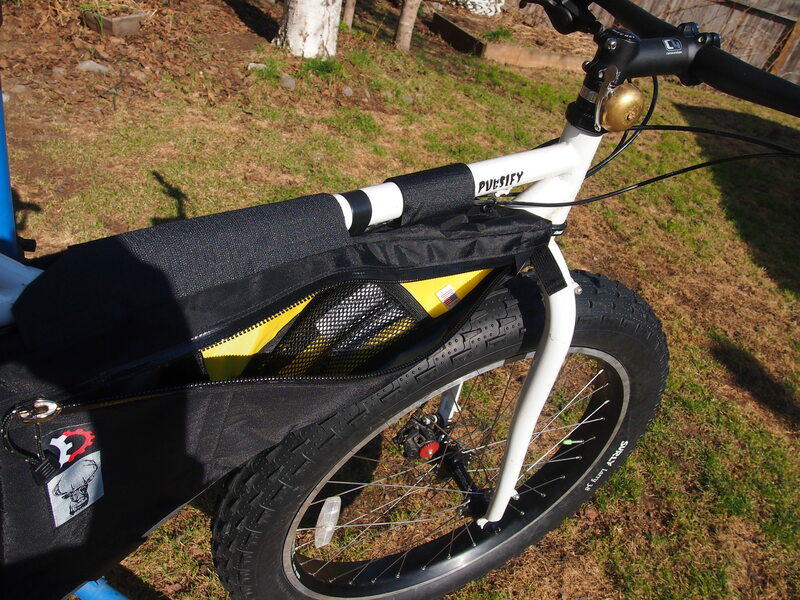 The Revelate framebag is included in this price and has never been used. These bags are currently out of stock. We can negotiate a price without the bag, if you’d like. The bike is listed on Craigslist for $1350 with everything pictured (except pedals). It’s $1250 for anyone that saw it here. Tell your friends. 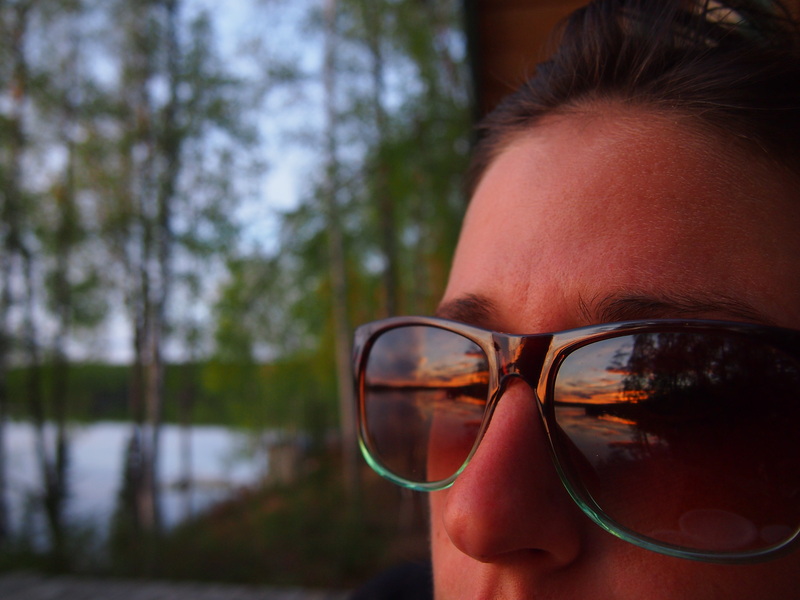 For those that are wondering, Lael will be traveling to the UK for a month-long intensive yoga teacher training in June. 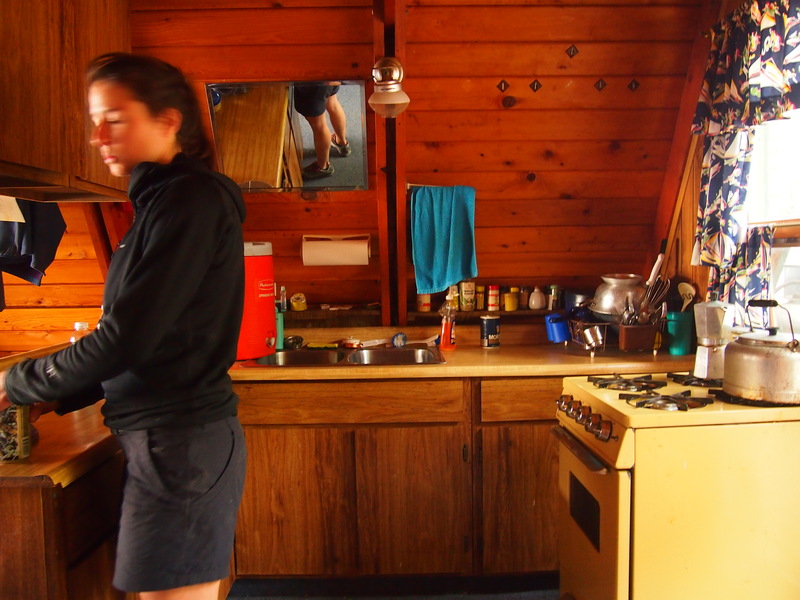 She will then be traveling in France and Corsica, on foot and on a borrowed bike. Upon returning to the States, she will meet me in the Southwest for two-wheeled exploration. The cost and complication of shipping her Pugsley outweighs her attachment to it. She’ll be looking for another bike when she returns to the US. 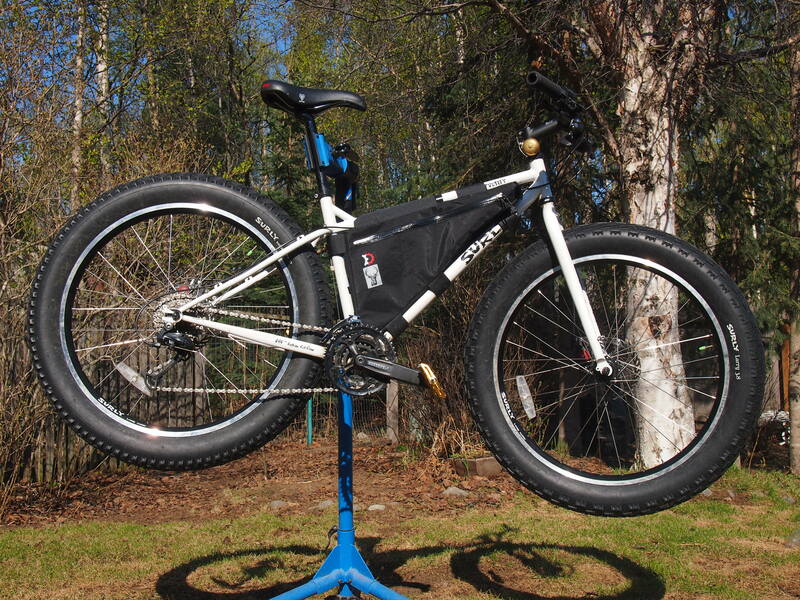 She’d like a hardtail 26″ or 29″ mountain bike, or another fatbike with lighter wheels. She thinks she would “kill it” on a 26″ hardtail with 2.3″ tires. I’m still voting for a full fatbike. 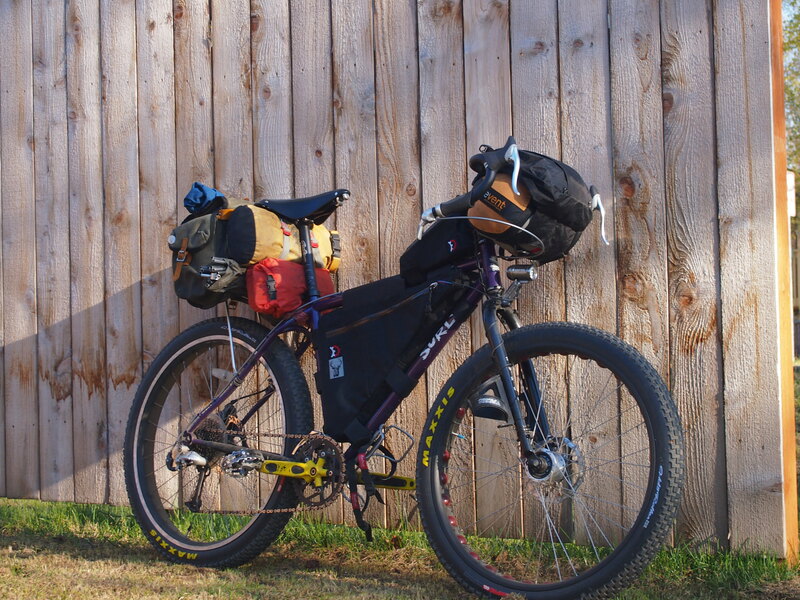 Her growing obsession with minimalism has shed a few more pounds from her touring baseweight and a lightweight build would suit her well. Anymore, she’s packing a 1lb 2oz sleeping bag, a puff jacket, a pair of Ray Ban sunglasses and an apple. There’s a man in this town with a garage full of bikes. Most of them are steel and many of them are Surlys. A few– horses of a different color– have names never intended. A heat gun and a steady hand allow for some anagrammatical tomfoolery. The Big Donkey is a half-fat longtail that hauls solar panels and firewood into forest lands for hydrology studies. The Karate Mummy is actually a push bike for a very small boy, who asks if he can put pedals on his bike. 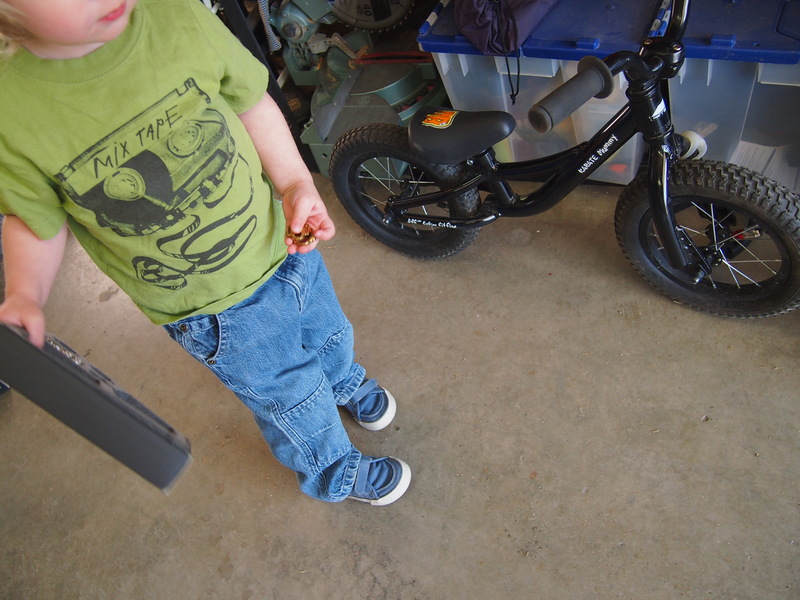 The little guy has got some fancy clipless pedals exhumed from a parts box and he’s inspecting the would-be bottom bracket region. A bike like this is meant to teach the balancing technique of two wheels; the rider shuffles along the ground as on a velocipede. “Pedals? It’s not quite that simple”, the Surly man explains. Someday. The Surly man, Nate, first appeared on my doorstep in response to a Craigslist ad for a fatbike tire. 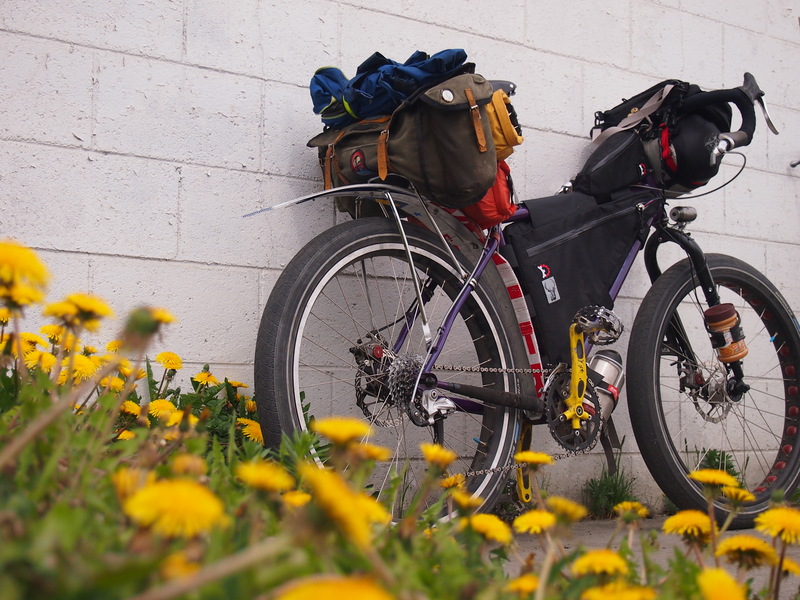 The not so surly Nate rides a Big Donkey to which he has now mounted a 3.7″ Surly Nate tire. 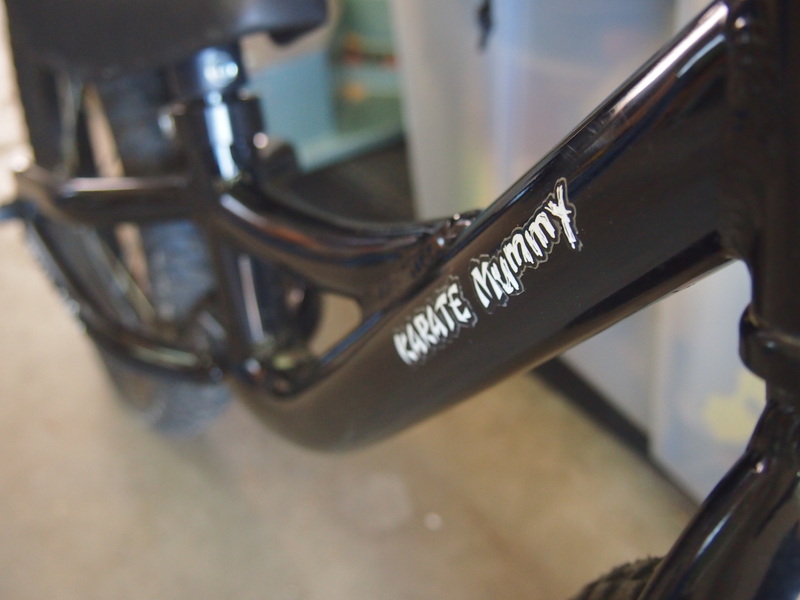 The little black velocipede known as the Karate Mummy has a full complement of Surly decals including the “fatties fit fine” chainstay logo, “SURLY” on both fork blades, and a “Large Marge” sticker on the 12 inch rims. It looks a lot like daddy’s green 1×1, which is actually a dinglespeed with two cogs and two chainrings. Perhaps daddy’s rig should be named the 2×2 and the Karate Mummy be renamed the 0x0, for the lack of pedals and gears. 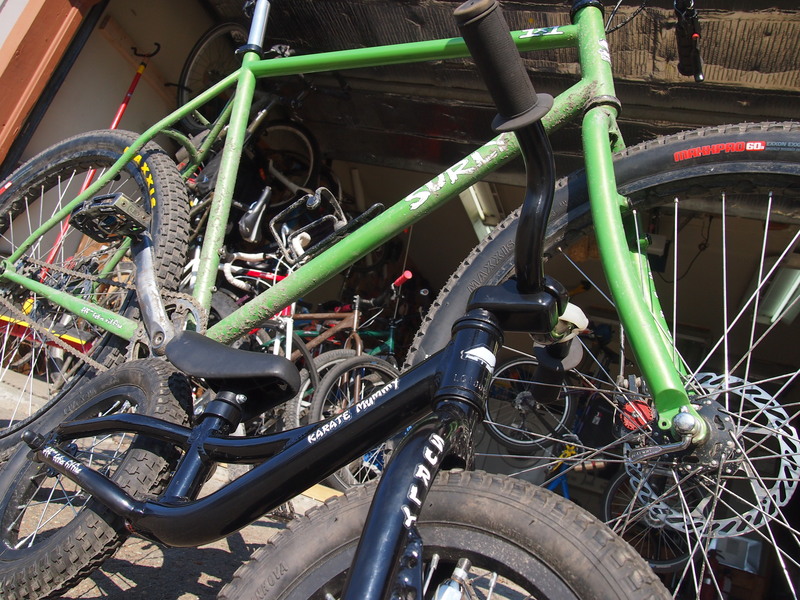 The Surly man might have to invest in a Surly Ogre to get two good zeros (0’s) for the project. 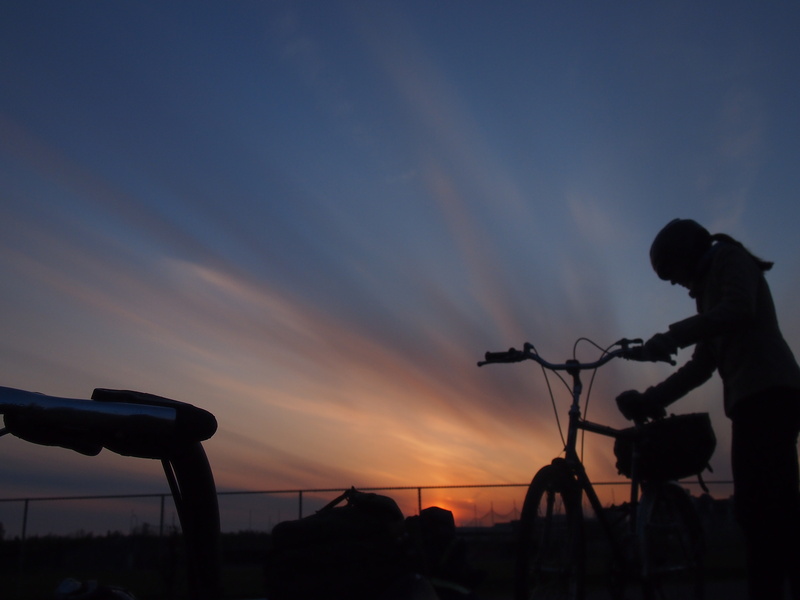 The Surly Man’s Rag is worth a read, where he is known as the Bike wRider. 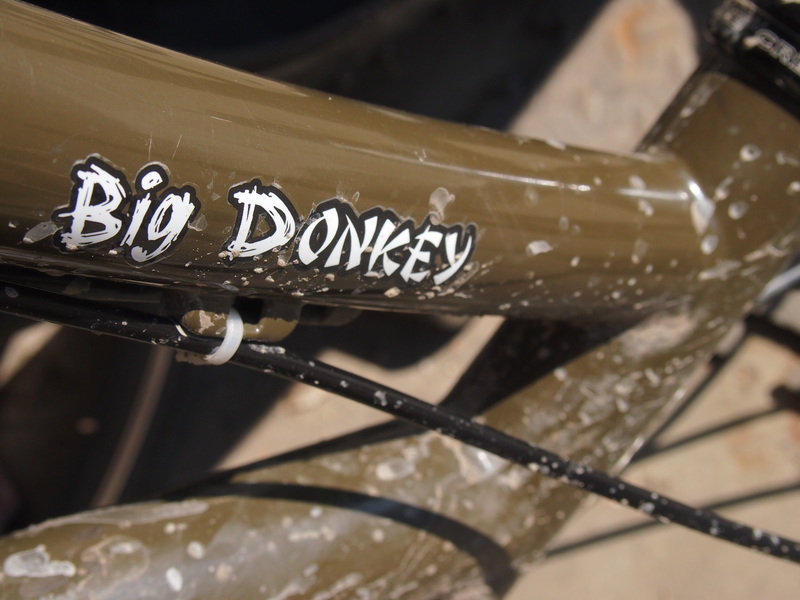 Most recently, the fat-front Big Donkey teamed with a genuine Big Dummy for some dirt riding and hydrology studies. 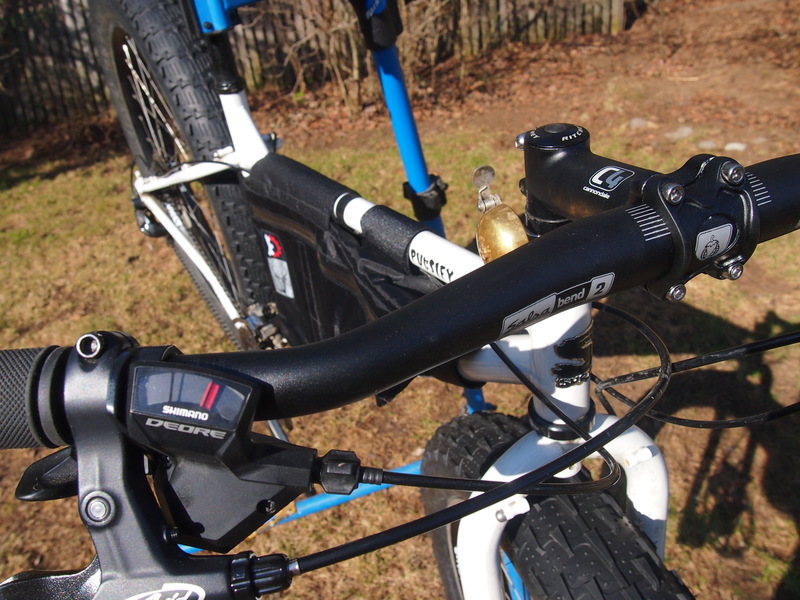 My favorite posts feature Little wRider on the black 0x0 velocipede, aka the Karate Mummy. I might ride this, although it changes every day. Large Marge and Marge Lite with Holy Rollers for now. I wish I had some Schwalbe Fat Franks or Big Apples in 26 x 2.35. The creme colored Franks are nice. If I roll on 559-65mm rims, all I need are two fat tires to be riding full fat again. Holy Roller, Big Apples, Fat Franks– baby fat. For now, road levers paired to Avid BB7 Mountain calipers work fine and offer powerful braking with featherlight one-finger operation. Stopping power is exceptional although the feel is unfamiliar. The cable pull is improperly matched and the levers feel squishy. I’ll experiment with some V-brake compatible road levers soon. From full fat to half-fat, then baby fat. I call it Little Guns. One of you knows a bike that has had the same name, but that bike has since passed on. I’m busy lining up ducks and dotting “i’s” and knotting loose ends. I leave, finally, this coming Monday or Tuesday. A gathering will take place at my house on Sunday evening, 6:30 PM. Bikes, burgers and beer will be present. Will you? Ride your bike for a free meal and a beer. Motor vehicle parking is limited, and costs $20 (payable in cash or check, to me). If you’re anywhere near Anchorage and don’t know where I live, email me at nicholas.carman@gmail.com. If you have a fun bike or a favorite bike or a weird bike, ride it.